2019 is CBE’s 50th anniversary year! 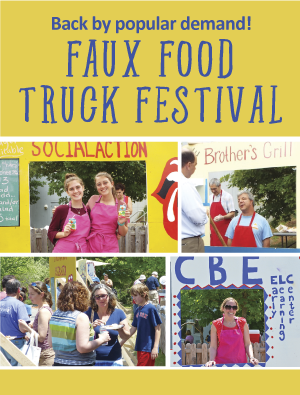 Help us kick off the celebration by attending our famous Faux Food Truck Festival! This year we’re thrilled to feature the phenomenal band MixnMatch — featuring vocalists Wendy Linden and Rachel Weitzner! ("MixnMatch is a soulful, multigenre cover band playing an eclectic mix of R & B, pop, acoustic, and rock music." www.mixnmatchband.com). Help us plan by registering and prepaying by May 15th for a discount on your cover charge! Cover charge at the door: $10 per person with a $15.00 cap per family. For more information contact Barbara Frank Michaelsen at socialaction@bethelohim.org. * How many family members are coming?